Happy Thanksgiving, everyone! 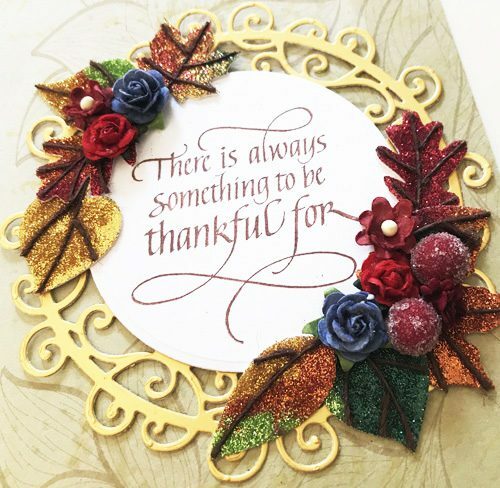 Yvonne here sharing a card just for the occasion, using 3D Foam Leaves with lots of glitters. The veins on the leaves are so easy to create and make your leaves look oh so pretty! Simply mount a piece of kraft panel to a patterned cardstock panel and then onto a white card base, using the E-Z Runner® Grand refillable Dispenser to adhere all the layers. Die-cut the swirled circle from gold cardstock and adhere onto the card base with 3D Foam Squares White Regular Size. Stamp the sentiment with brown ink upon a piece of white cardstock and then die-cut and emboss with a circle shape. Adhere it to the card base using 3D Foam Squares White Regular Size. Remove the top liner from one of the 3D Foam Leaves. 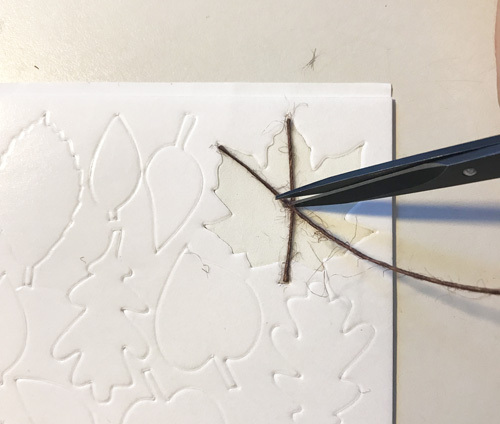 Place pieces of brown twine on top of the leaves to create the veins. Cut excess parts with scissors. Sprinkle glitter on of the “vein” and leaf. Gently rub the glitter using your fingers to secure. 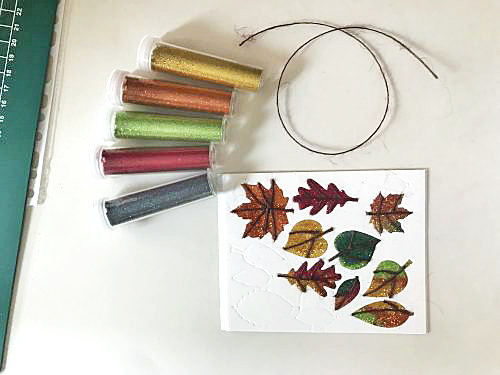 If you use small amounts of glitter in different colors, you can create a beautiful multiple colored fall leaf. Repeat to make as many leaves as you need to use on your card. Adhering the 3D Foam Leaves to the card is super easy! 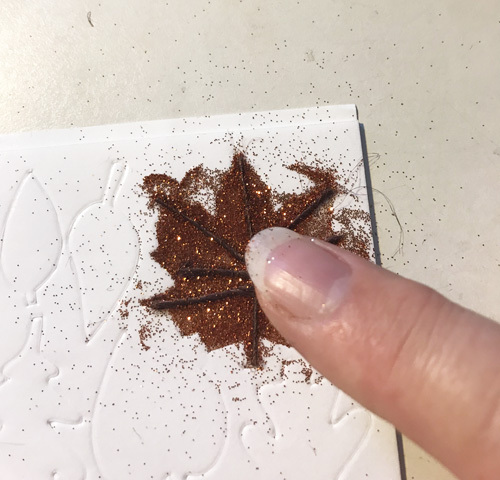 Simply lift the glittered leaf from the sheet and place onto the card (yep, because it’s self-adhesive!). 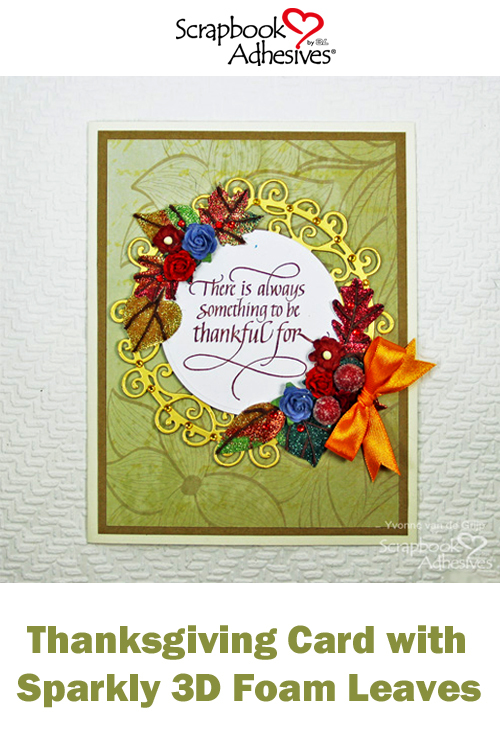 Now finish your card by adding some mulberry flowers, berries and a bow to the card using Adhesive Dots Medium. Lastly, add a satin bow and some extra accents like adhering rhinestones. This entry was posted in 3D Foam Shapes, 3D Foam Squares, Adhesive Dots & Lines, Adhesives, Cards, Crafts & Tutorials, E-Z Runner® Grand, Embellishments, Fall, Intermediate, Permanent Adhesive, Seasonal Craft Ideas, Skill Level, Tutorial, Wear your Adhesive on the Outside and tagged 3D Foam Leaves, 3D Foam Squares Mix White, 3D Foam Squares Regular White, Adhesive Dots Medium, Card, Card Making, E-Z Runner Grand Dispenser, E-Z Runner Grand Permanent Strips Refill, Fall, Quietfire Design, Spellbinders Paper Arts, Thanksgiving, Wear Your Adhesive on the Outside, Yvonne van de Grijp. Bookmark the permalink.